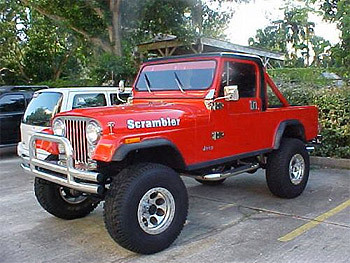 We have done our best to list pictures of Jeep Scramblers that have been emailed to us. If you see a discrepancy in a year or description, give us a holler! 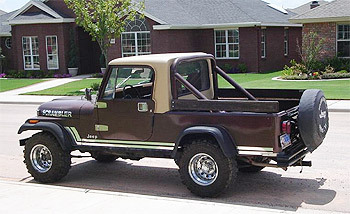 My 1982 jeep scrambler has only 33k original miles and everything works well. I bought this jeep to put out on the deer lease but it was so nice that I couldn't take it out there to get it all scratched. It is loaded with many pieces of extra chrome. 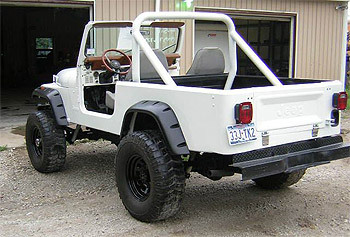 the jeep has got chrome scrambler lettering, hinges, headlight covers, and mirrors. this jeep also has the original wood boards that came in the bed. the bed has a spray in liner as does the inside of the cab. Want to buy or sell a jeep? 6 - Cyl. THIS CLASSIC DOES NOT HAVE A SCRATCH ON THE BODY OR ANY RUST WHAT SO EVER. I HAVE OWNED MY SCRAMBLER FOR 6 YEARS NOW. You are looking at my pride and joy. I have been an avid Jeeper and rock crawler for the last five years. In the last few years I upgraded to buggies and kind of took some of the fun out of it with a lot of expense added in its place. I have started a small HotRod and Motorcycle shop on my off days from the fire dept. and police dept. and this was one of my first creations that I have just completed. 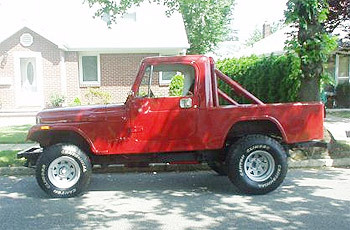 1985, CJ-8 SCRAMBLER, RECENT FRAME-OFF RESTORATION, SOLID RUNNING IN-LINE 6-CYLINDER, 4 WHEEL DRIVE WORKS PERFECT, NEW CUSTOM PAINT JOB, EXTENSIVE STAINLESS STEEL ACCESSORIES. NEW AM-FM, CD PLAYER, NEW MICKEY THOMPSON RIMS, AND NEW UPGRADED SUPER SEATS. I have owned this Scrambler for the last 4 years, and it is my favorite and best car I have ever owned. This Jeep has been on many thousand-mile adventures into the mountains and deserts of Mexico without ever giving me any problems. 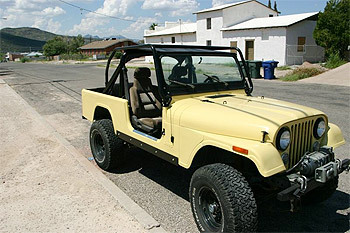 The body on this Jeep has been recently painted with a Chrysler color 2004 yellow paint. This color is not a pure yellow; it has a much quieter tone to it, almost a creamy yellow.